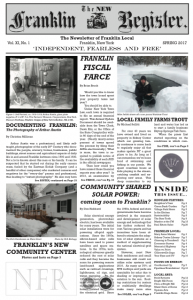 Download a PDF copy of the New Franklin Register Issue #31 (8.9 MB) by clicking on the image. See the index of this issue, and links to all previous issues, on the index page. 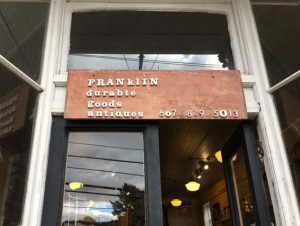 Entering Franklin Durable Goods, the antiques shop on Main Street, is a bit like walking into a sea of enticing objects, as waves of alluring – if sometimes odd – items wash over you, drawing you deeper into this unique emporium. Here a metal statue of a tiger, there glass bottles from some long-ago pharmacy. Here a spear for snaring eels, there steel hooks to lift ton-bags of grain. All this and more, artfully displayed on a pool table or a staircase or even (upstairs) on a coffin, to catch your attention and make you want to touch, pick up or marvel. 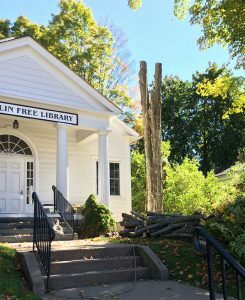 People around town may notice that the Franklin Free Library has removed a large old maple tree on the west lawn. 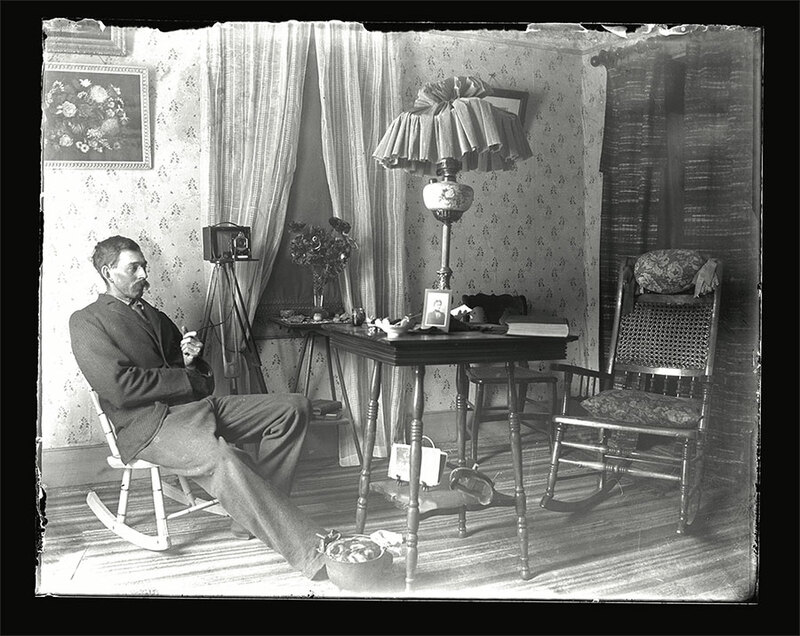 By the time you read this, the second old maple may be gone as well. This is the exciting beginning of a major upgrade to the Library. Plans are being implemented to create a cellar entryway into the Library, with a wide level walkway from the village sidewalk. Patrons will be able to use wheelchairs, scooters or walkers to get easily to the new entryway. Once inside, a personal wheelchair elevator will provide access to the Main Floor, for programs and the book collections. A new Reading Room is being planned in an area inside the new entryway. The current bathroom will be enlarged and new fixtures will make it accessible for people in wheelchairs. The emergency exit at the rear of the Library will be enlarged and ramped for accessible, safer exiting. Inserted into each copy of issue #30 of The New Franklin Register is a single-page survey to measure our readers’ feelings about and participation in the local economy. The Greater Franklin Chamber of Commerce, whose primary mission is to enhance and support local business in and around the Town of Franklin, needs your help to determine what is important to Franklin’s residents and visitors, as well as what might be needed in our community in terms of business and services. Survey results will be presented in the Spring 2017 issue of The New Franklin Register. Please respond! Your participation and feedback is important to Franklin’s economic future! 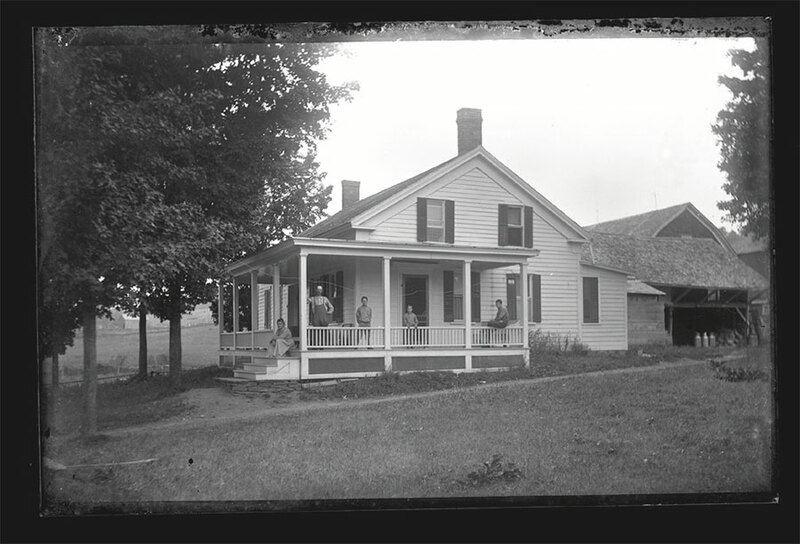 The survey refers to the Franklin NY Comprehensive Plan of 2006 which is available on this website. Christmas Stroll, Holiday Market and More! 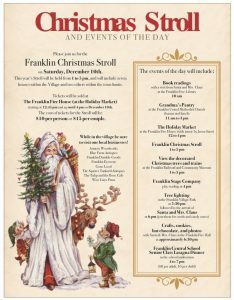 Please join us for the Franklin Christmas Stroll on Saturday, December 10th, from 1 to 5 p.m. It will include seven houses within the Village and two others within the town limits. Tickets will be sold at the Franklin Fire House (at the Holiday Market) from 12:45 p.m. to 4 p.m. on December 10th. Stroll tickets will be $10 per person or $15 per couple. During the day, please visit our local businesses in the Village of Franklin. Download a PDF copy of the New Franklin Register Issue #30 (4.6 MB) by clicking on the image. See the index of this issue, and links to all previous issues, on the index page.